I walked into my sons room the other day and found crumpled diapers everywhere. Apparently my daughter decided that her bear needed a diaper and then another diaper and then another. After a little talk about how diapers are not toys I let her help me pick some fabric from my stash and we set out to make some diapers that she could play with. 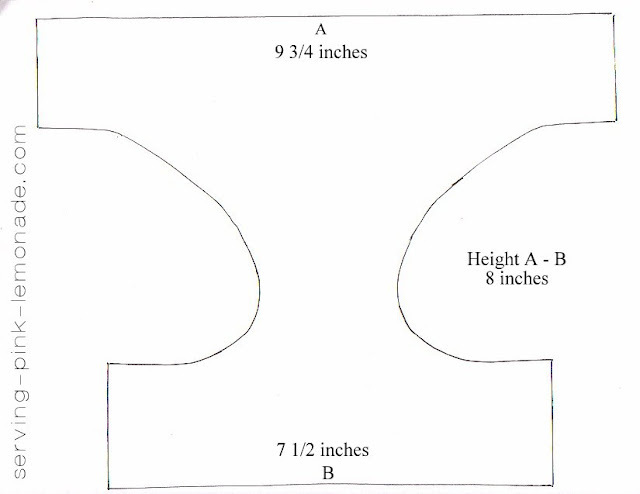 This pattern fits my daughters 12-13 inch dolls and stuffed animals. I cut the pattern out twice. 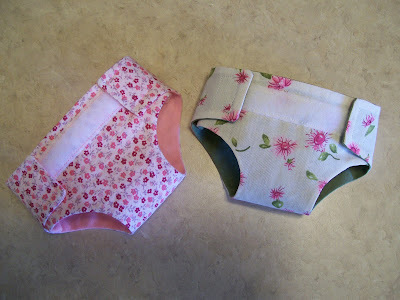 Once for the diaper and once for the lining. If you're an advanced sewer then you should know what to do from here. - Sew right sides together, leaving an opening to turn right side out. - Clip curves and corners. Turn. Press. Sew opening. If you're a beginning sewer and would like some great step-by-step instructions visit HERE. No more ruined diapers. Phew! Very Cute. My baby girl is just getting old enough to play dolls. Good idea--yours looks so cute! love this....my daughter did the same thing!